Good: Strong arsenal of prospects, Fair assortment of Hall of Famers, Good overall value, Hits are primarily autographs. Bad: Poor card design, Haphazard assortment of insert sets, No Bryce Harper, Many of the key prospects already have more desirable Bowman Chrome autographs. 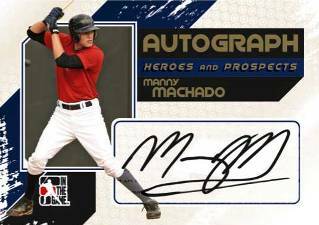 The Bottom Line: 2011 In The Game Heroes & Prospects Baseball is worth checking out for prospect minded collectors who are looking for a higher ratio of hits per dollar then what 2011 Bowman Baseball has to offer. However a hodgepodge of inconsistently designed insert sets and a lack of “Hero" autographs on a box to box basis prevent it from truly distinguishing itself as a great product. There are without a doubt some good looking cards to be found in 2011 ITG Heroes & Prospects, particularly among the autographed patch inserts and the Between the Seams autographs. My biggest qualm with the aesthetic appeal of 2011 ITG Heroes & Prospects is that the set design as a whole lacks any sort of cohesive theme that ties the various insert sets together. The result is a hodgepodge of cards that look like they were taken from different baseball card sets. The prospect talent in 2011 ITG Heroes & Prospects Baseball is undeniable. Delino DeShields Jr., Julio Teheran, Josh Sale, Manny Banuelos, Manny Machado, Michael Choice, and Philippe Valiquette are among the blue chip prospects who signed cards for the release. The problem is that a good portion of the banner prospects already have Bowman and/or Bowman Chrome first year autographed cards, making their ITG autographs less valuable and desirable. On the flip side, they give prospectors and Minor League Baseball fans significantly more affordable options for buying autographs of their favorite prospects. If you are drawn to the product because of the “Heroes" rather than the “Prospects" side of things, you will likely be disappointed. Hall of Fame players are an afterthought, with the prospect side of things being far and away the primary focus of the set. Think of the Hero autographs as being reasonably possible bonus rather than a major component of the product and you are unlikely to be disappointed. At the time this review was written, a hobby box of 2011 ITG Heroes & Prospects Baseball will run you right around $90. At 5 hits per box (the majority of which are autographs) you are looking at a price per hit cost of roughly $18. Compare that to 2011 Bowman which has a price per hit cost of $65. With that said, Bowman cards are worth far more on the secondary market, and boasts legitimate big hit potential – something that 2011 ITG Heroes & Prospects severely lacks. But while ITG lacks home run potential, it could very well provide more financial return per hobby box then Bowman does. So ultimately you get less risk at the expense of less reward. This was the first In The Game product I've ever opened so I wasn't quite sure what to expect. 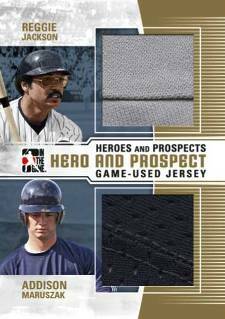 Though it had some shortcomings, I have to say that all and all Heroes & Prospects Baseball made for an enjoyable, albeit brief, box break. 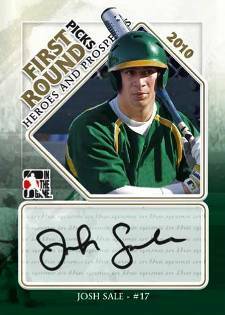 2011 In the Game Heroes and Prospects Series Two Low Numbers Baseball sees the Canadian company's return to the diamond with another set that is only autograph and memorabilia cards. Mixing upcoming prospects with some of baseball's greatest legends, this unlicensed set provides a lower-cost alternative for those who worry more about signatures than logos. New inserts include one-of-one bat barrel cards, autograph cards made exclusively from checks and US President autographs on baseball leather. Several Series One inserts return as well. Each five-card box has all autograph and memorabilia cards. 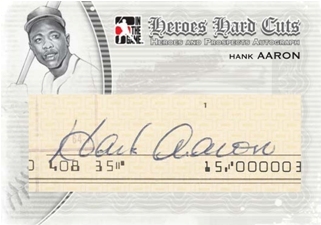 Heroes Hard Cuts (/1) feature signed checks from such baseball legends as Hank Aaron, Gaylord Perry, Bobby Doerr, Stan Musial, Willie McCovey and Ralph Kiner. 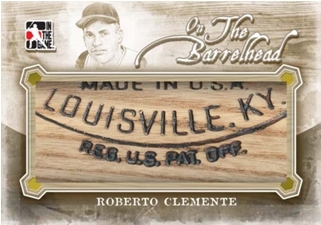 On the Barrelhead (/1) includes over-sized game-used bat pieces from Roberto Clemente, Barry Bonds, Eddie Mathews, Alex Rodriguez, Sammy Sosa, Mike Schmidt and more. 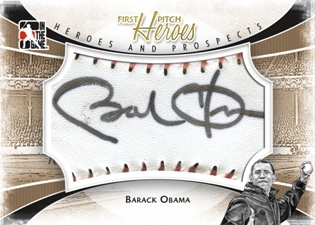 First Pitch (/1) embeds signatures from US Presidents on baseball leather. Between the Seams offer autographs on baseballs, much like Upper Deck's Sweet Spot Signatures. Heroes PaperCuts cut signature autographs. Batting Tips bat knob cards. Heroes Autographs have signatures from some of baseball's all-time greats. Jumbo patches are highlighted with Grand Slam Memorabilia. Game-Used Jersey, Number and Patch cards. First Round Picks autographs highlight early selections. Hero and Prospect Game-Used Jersey pair up past and future stars with dual swatches. 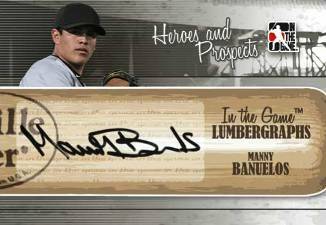 Lumbergraphs return with more signatures on a bat-design card. Father and Son Autographs offer family-themed signatures. 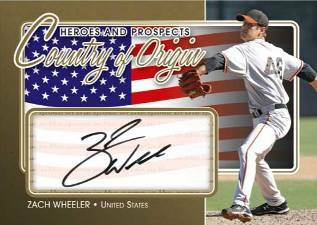 Country of Origin Autographs give a patriotic design to the featured signer. One one-of-one in each 12-box case. Six Heroes inserts in each 12-box case. First time seeing these, looks interesting.